The plans for this road trip had changed dramatically since I had left home three days earlier. I was supposed to be in Death Valley with Patrick but had ended up in the White Mountains with Laura. Instead of chasing P1Ks in the desert, we were chasing 10,000-foot summits in the Whites. It was a combination of Patrick not getting his car out of the repair shop in time and Bob Sumner's inspiration to tackle the non-Sierra 10K summits. Two days earlier, the Bob and I had climbed the last one he had to do on this odd list, Peak 10,088ft in the Inyo Mtns. I knew I had a bunch to do still in the White Mountains, which just happens to be one of Laura's favorite places to visit, so she and I ended up there for the weekend. Laura met me near the SR168/White Mtn Rd junction around 7:30a, then we drove our cars up to Schulman Grove at the end of the paved section to leave the van. The Sierra had just received a modest amount of snow which made for some pretty scenery, but the Whites had remained snow-free up to around the 12,000-foot level which would make for a very pleasant day of rambling about in dry conditions. Located about 1.5mi SW of Station Peak along Crooked Creek, this one makes for a short outing of 3/4mi, one-way, with about 600ft of gain. We were happy to find the dirt Crooked Creek Rd in decent condition and managed to get Laura's Element to our trailhead near the junction of Crooked Creek's North and South Forks with little trouble. There was almost no water in the creek at this time, though there were some small puddles that we needed to drive through. A truck we passed earlier on the White Mtn Rd had driven up Crooked Creek just ahead of us, scattering pieces of ice from the puddles in all directions. Starting up from a small turnout on the road, we hiked up the SW Slopes, some high-stepping necessary to negotiate the modest brush near the bottom, soon becoming easy to navigate, ankle-high stuff as we gained elevation. It took me less than 30min to reach the summit where I immediately moved to the leeward side to get out of a cold wind blowing over the top. Laura arrived about 10min later. She was particularly enthralled with the view east where a sea of clouds stretched out in that direction over Nevada, a sight she had never seen before (she's been up here far more times than I, so found it all the more impressive). To me it resembled a more familiar view overlooking the Pacific from one of the coastal ranges. The views from the summit take in most of the Crooked Creek drainage looking south, with Iron and Sage Hen poking up to the southeast and Bucks, Blanco and County Line Hill to the southwest. There is a very nice view of Station Peak to the northeast with the highest summits around White Mtn Peak to the northwest. This pair of summits is located just north of Crooked Creek and the UC Research Station. There is a large parking area on the south side of the road that can by used to reach both peaks fairly easily, less than half a mile to each. This was the original plan, but upon considering our options, Laura decided to skip these two in favor of the next pair of peaks we planned to do that would have better views. As they were a little more than two miles from Peak 10,460ft, I decided it would probably be faster to just tackle them from here, Laura returning to the car and then picking me up at the parking area just mentioned. We bade goodbye temporarily, Laura descending while I headed west across the undulating terrain, not really finding a good ridge to follow but at least with easy cross-country. I spent a little less than an hour to make my way to Peak 10,820ft, sporting a new register left by Greg Gerlach back in July, Bob Sumner visiting in the interim. From the summit, the research station is clearly visible to the south as was the orange Truck of Fun parked right where it was expected in plain sight. 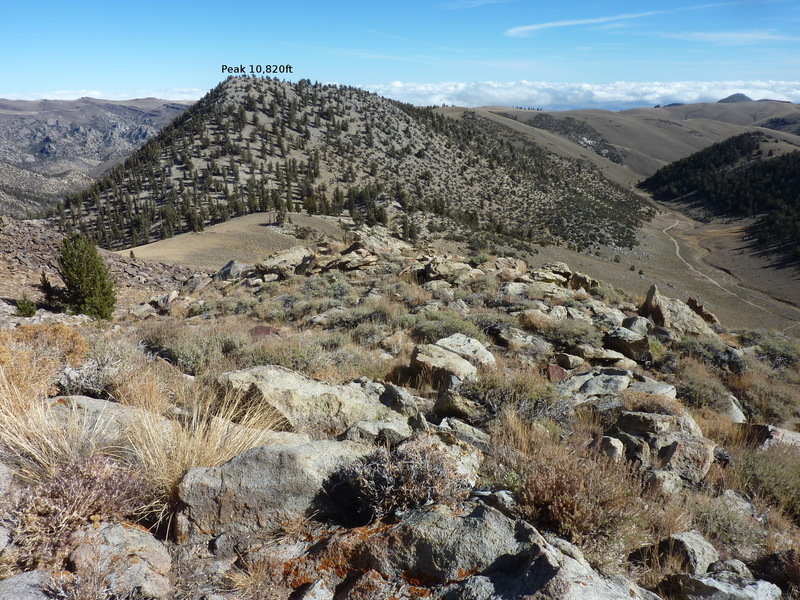 The slightly lower Peak 10,780ft was half a mile to the southwest, separated by a 300-foot saddle. It took barely 15min to get from one summit to the other and less than that to drop directly down to the Element where I found Laura awakened from a light nap. These three summits lie to the west of the main crest, separated by the Silver Creek drainage. I had seen the two higher ones on previous visits but had found no roads leading out to them. They would require a heftier effort than most of the other peaks in the area and we expected them to have fine views overlooking Owens Valley and the Sierra. We reparked the Element in the small turnout at the lowpoint along the crest overlooking the Wyman Creek drainage, just south of County Line Hill. We would have to drop almost 1,000ft into Silver Creek before starting the climb up to the southernmost of the three peaks. We found the going moderately brushy to start, improving somewhat as we got lower. The dry creekbed at the bottom turned out to make for the easiest travel with little brush to contend with. Footprints and parallel, wheeled tracks in the sand suggested someone had pulled a small cart in the drainage recently. Laura guessed it was probably hunters using it to haul out their deer. We followed the drainage south for just over a mile, passing through a narrow section of the canyon that proved no serious impediment other than perhaps to someone trying to pull or drag a wheeled cart through. Once we were lined up with the northeast slopes of Peak 10,140ft, I turned to Laura, pronouncing, "Now for the fun part!" We had to regain all of the 1,000ft we had just lost to reach the summit less than a mile away. As I started up the slope ahead of her, Laura told me to expect her about an hour behind me. It would not take her that long. I reached the top in half an hour, Laura in about twice that. The wind was not blowing so much now and the sun warmed me nicely, making my stay at the summit no particular hardship. The views west were nice as expected though there was some haze. Another register here was nearly identical to the previous one, save for the different dates and the addition of Laura's signature. Laura had been fighting a cold for the past several weeks and feeling the effects from it all day. She decided she would forgo the other 10,000-foot summit and simply head back to the car at a more relaxed pace. I had been at the summit long enough to note that I might also tag Peak 9,820ft as a bonus on my way to Peak 10,420ft further north. It was not long before 2p at this time and I told Laura it would probably take me until 5p to return. With that we parted ways, Laura resting longer at the summit while I made my north along the ridgeline. After about half an hour I reached an intermediate bump between the two 10K summits. Peak 9,820ft was located along a subsidiary ridge dropping west from this bump, about a mile away. It would take me about an hour to make the excursion out and back, some minor scrambling along the ridge where the peak rises up almost 300ft from a saddle. Back to the main ridge, I continued north for another mile to the higher summit, Peak 10,420ft. Neither summit had registers. This last summit was the more interesting, the top consisting of a small limestone outcropping. I spent the last hour making my way back down and across the Silver Creek drainage, a fairly mundane effort with no serious obstacles, arriving within a minute of the appointed 5p return time. I found Laura bundled in her orange parka sitting out in her chair while playing with photos on her iPad.